Tomorrow's Saturday! Yay! And I've got just a few plans for the Anzac Day long weekend ... hmmm ... garden bed building tomorrow and my traditional Anzac Thanksgiving on Monday. What's that? Well I have to be true to my American roots ... but who wants to cook a real Thanksgiving in Brisbane in November? So this is my compromise, it's at least autumn here, and a public holiday. But just wait till next week ... lots of Thanksgiving recipes and pictures! 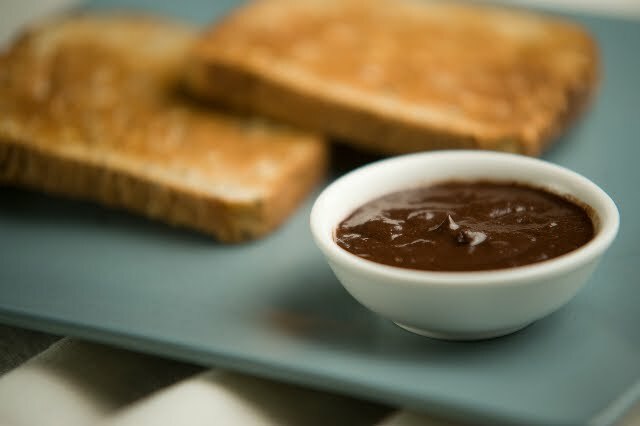 So of course we'll need some energising food to keep us going ... and what better way to start the day than with chocolate on toast. Now this particular recipe isn't the hazelnut and choc spread you can buy at the shops (and we all know what I'm talking about - check the ingredients label sometime) but my interpretation of one I saw in the natural foods shop. I looked at the ingredients as I always do, and thought - hey! I can make this! Here we go. Mix everything together. Put it in a small dish for serving and a small pot for storing in the fridge. I've kept mine in the fridge for a couple of weeks no worries. I haven't costed this out, but it's not as expensive as the $8 jar at the shops, plus I use these ingredients all the time so always have them on hand. @Anonymous Yes please! Sounds delish!